The NFPA and CGSB standards committees are staffed by subject matter experts and highly experienced industry personnel, resulting in excellent non-commercial guidance and test protocols. 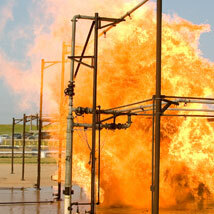 Research was conducted at the independent labs of Texas A&M’s TEEX facility, Brayton Fire Field, in prevailing environmental conditions over several days. This testing aimed to confirm the duration, average heat flux and speed of actual outdoor flash fires.The parameters of the testing were based on the best available science and accident investigations. The two organizations intended to require passing performance against a typical flash fire, which they defined as diffuse fuel and a rapidly moving flame front that is short duration (NFPA) and lasting typically 3 seconds or less (CGSB). Results conclusively showed that no single sensor recorded a flash fire duration of 3 or more seconds. This was true regardless of position in the flash path, wind speed or direction, amount of propane released, etc. In fact, the vast majority of exposures were 2 to 2.25 seconds. A flame front is, by definition, directional. That is, if it is moving toward your face rapidly, and self-extinguishing as it moves by consuming all the fuel, then you would not predict burns to your back. At ignition, there is a portion that is burning and a portion that has not yet ignited. As the flame front moves into an area of fresh fuel, it becomes a three-phase event. Behind the flame front is an area where the fuel has been consumed and the fire is out, then an area of flame, and ahead an area of unignited fuel into which the flame is moving. The sensors in this experiment confirmed this observation. The most conservative way, which yields the longest duration, is to count all time the sensor records heat above ambient conditions, as is the protocol for this work. The second way is to approach the data from a perspective closer to the lab flash fire and arc flash analysis, which are predicated on avoiding or minimizing second degree burn and worse. Based on these preliminary results, the flash fire standards are consistent with what has been set forth regarding duration, heat flux and speed of flash fires. In the end, the goal of NFPA 2112 is to create relevant, scientific, reproducible results which quantify the relative protection of materials against industrial hazards. Read the entire article on page 4 of Flame Resistant Insights from Scott Margolin, International Technical Director at Westex by Milliken.